Most of the time, the construction of an architect-designed project proceeds according to plan. Construction unfolds on time. The construction documentation is clear and free of ambiguity. The trades perform their work skilfully and conscientiously. There are few surprises, be they physical or financial. The builder, owner and architect maintain a positive working relationship. Sometimes though, construction does not proceed according to plan. Through negligence, disagreement or accident, a project is derailed. The derailment might last a moment in time, soon forgotten, or it might endure the entire project, poisoning both the process and relationships. We have experienced and survived a number of derailments. They are stressful, sometimes expensive and always fractious. They test the good intentions of everyone involved. What follows is the 1st of eight disaster lessons from site. We ask what went wrong and review what we’ve changed in our practices to prevent it from happening again. An archive of the series can be accessed here. Prior to getting on site, prior even to signing the building contract, the builder started making our lives difficult. He provided insufficient explanation of his tender breakdown. He objected to provisions in the standard ABIC building contract that he had known about since the beginning of the tender period. He developed an aggressive attitude towards us. He became hard to reach by phone. These isolated events came to a head on the evening we were due to sign contracts, where a shouting match erupted over eleventh hour changes the builder wanted to include. The documents were left unsigned when he stormed out in a rage. Despite the warning signals, we met with the builder to smooth things over. He had two important qualities that lulled us into overlooking his confrontational attitude: he had previously worked with our client’s brother, who regarded him highly; and his tender was substantially less than the only other builder who tendered. We knew that rejecting him would mean re-tendering, and were worried we would not find another builder who could match his price. We felt at the time that we had no other choice but to plough in and hope we could manage him. So, to our long-lasting regret, we signed the building contracts with him. The subsequent construction process was a disaster, easily the worst experience on site we have ever endured. He bullied and abused us, lied to us incessantly, made us dread each visit to site, and turned what should have been a joyous period into an anxiety-filled one. The builder had an old-school approach to the construction process, right down to his poor paperwork, condescending nature and “She’ll be right, mate” responses to tricky questions. He felt his years of experience earned him the right to run our project however he liked, and our youth equalled incompetence. His apprenticeship-based education did not prepare him well for the age of information and paper trails, leaving him distrustful of any form of written communication. Whenever we challenged him on any point, he became defensive and unresponsive. Before contracts are signed, a builder should still be trying to sell himself to us and our client. He has not yet won the job, so it stands to reason that he must still try to woo us. He should be at his most accommodating, personable and enthusiastic. A builder who makes life difficult at first contact will not get any easier, and is likely to become more difficult, to manage once he has won the job and is on site. The lesson we learnt was that a good relationship between architect and builder is essential from the very beginning. If the warning bells start ringing before contracts are signed, we should not be afraid to re-tender. 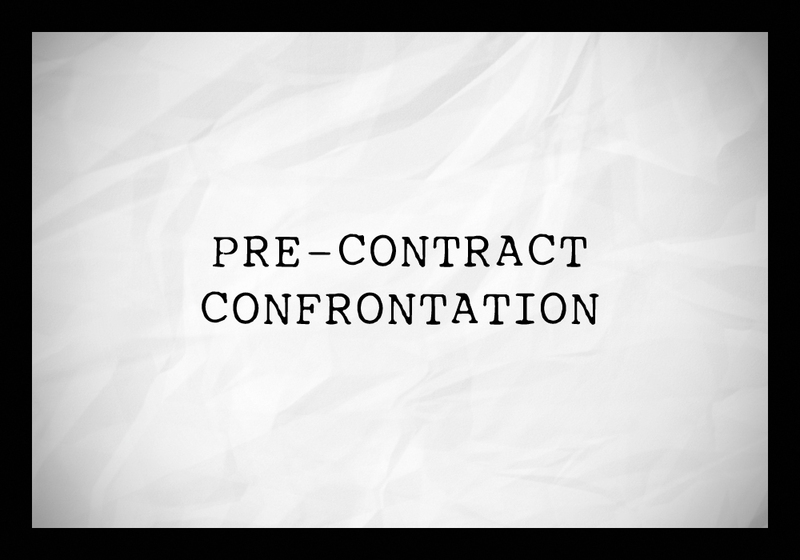 Pre-contract confrontation, author’s own image.